Princess Diana was the vision of happiness as she frolicked on a beach with her son, Prince Harry, on their last holiday a month before her untimely death in a Paris car crash. Photos have emerged of the princess looking stunning in a leopard print swimsuit as she swam in the glistening blue waters of Saint Tropez on 17 July 1997. 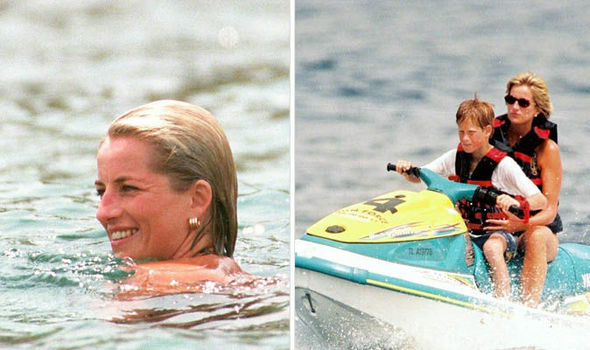 Beaming with delight the princess is seen watching Prince Harry play on a jet ski in what was to become a final family holiday before her death. The happy holiday images stand in stark contrast to the tragedy that would unfold a month later on August 31, when she and her friend, Dodi Al Fayed, died in a fatal car crash in a Paris tunnel. The photographs are a reminder of the fun-loving princesses love for the water – which she had adored since she was a small child swimming in her family’s pool at Althorp estate. Diana was on the holiday as a guest of Mohamed Al-Fayed, the former Harrod’s boss, who had invited her and her sons Prince William and Harry to spend time abroad his luxury yacht. She took a cruise of the Mediterranean on Al-Fayed’s yacht and traveled to the south of France to Sardinia before flying to Paris on August 30. In the throws of happiness the princess, can be seen diving into the water and swimming in the sea. Showing off her enviable figure, another image shows her riding a jet ski with Prince Harry holding onto her. The bond between mother and son was clear for all to see as the photographs capture happy moments between the pair during the sun-drench holiday. It is a bond Prince William and Harry shared with the world this week as they spoke about her in their documentary marking the 20th anniversary of her death. 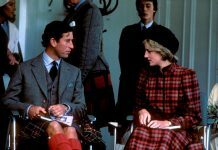 During the poignant and touching ITV documentary called ‘Diana, Our Mother’ the princes laid bare their pain at the loss of their mother. 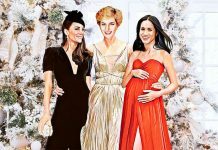 The princes painted a portrait of Diana, illustrating her love for her family, her zest for life, and her charitable work covering HIV/AIDS, landmines, and helping the homeless. The emotional documentary was watched by a television audience of 7.4 million people, proving the People’s Princess’s legacy still endures among much of the public. Featuring Elton John and other close friends of the late Diana, the princes opened up their private albums and spoke candidly about how much they missed their mum.